Description: Back when Amtrak was worth seeing, the 4 unit, 25 car SW Chief stops at Galesburg the first time I saw AMTK 157 which I've run across about 8 times since then. Description: This is the northbound, the crew always waved big at me and honked at me here, it made up a little bit of time and we were late getting into town, I have the first know photo of this unit since it got it's Bolt-O-Nose nose job at Boise and new paint after rebuilding, this was my first bolt-o-nose unit. The train arrived into Poplar Bluff at 7:08 A.M., 3 hours and 59 minutes late. READ THE COMMENT I LEFT BELOW!!! Description: Amtrak P42 157 highballs past the Metra station in Brookfield with the westbound California Zephyr. 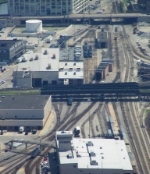 Description: Here is where Amtrak works on their Chicago Assigned Units and Passenger Cars. Description: I guess if I had a favorite Amtrak Unit, it would be 157. I've crossed paths with it several times since 2003 in like 7 different states. Description: 10 hour late train 92 slides past a switching job to head for the richmond station. Description: P092 works the station at Winter Park. 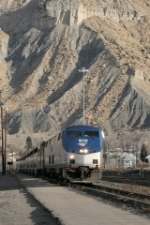 Description: Amtrak train 3, the Westbound Southwest Chief, rolls into Albuquerque on Main Track 1. Description: AMTK 80 slows to a stop at the High Point station as he comes by the rear of 158, who is waiting at Hoskins for 73, 80, and NS 218. Description: Right behind 930, 721 glides down into Binghamton.